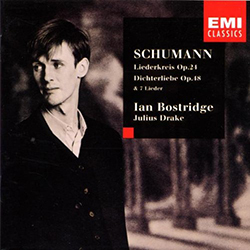 Bostridge makes you think anew about the music in hand, interpreting all these songs as much through the mind of the poet as that of the composer, and, being youthful himself, getting inside the head of the vulnerable poet in his many moods. Quite apart from his obvious gifts as a singer and musician, that’s what raises Bostridge above most of his contemporaries, who so often fail to live the words they’re singing. Every one of the magnificent Op-24 songs has some moment of illumination, whether it’s the terror conveyed so immediately in ‘Schöne Wiege’, the breathtaking beauty and sorrow of ‘Anfang wollt ich’ or the breadth and intensity of ‘Mit Myrten und Rosen’. In between the two cycles comes a group of the 1840 Leipzig settings that adumbrates every aspect of Bostridge’s attributes, as well as those of his equally perceptive partner. The vivid word-painting in Belsatzar brings the Old Testament scene arrestingly before us. Perhaps best of all is the unjustly neglected Es leuchtetmeine Liebe, a melodrama here perfectly enacted by both performers. Mein Wagen rollet langsam forms a perfect introduction, in its lyrical freedom, to Dichterliebe, an interpretation to rank with the best available in terms of the sheer beauty of the singing and acute response to its sustained inspiration. Listen to the wonder brought to the discovery of the flowers and angels in ‘Im Rhein’, the contained anger of ‘Ich grolle nicht’, the sense of bereavement in ‘Hör ist das Liedchen’ and you’ll judge this is an interpretation of profundity and emotional identification, the whole cycle crowned by the sensitivity of Drake’s playing of the summarising postlude. To complete one’s pleasure EMI has provided an exemplary and forward recording balance.